How we know that the number of illegals in the country is more than twice the number generally assumed? Commerce Secretary Ross, who oversees the Census Bureau and who made the decision to include the question, has already said as much. In announcing that the citizenship question would again be included on the 2020 Census, for the first time since the 1950 Census, Secretary Ross provided an 8-page explanation for including the question. Secretary Ross did not need to provide any explanation, but he correctly anticipated his decision would produce an uproar followed by litigation. Among other points, he noted the need for a reliable calculation of the citizen, voting-age population in order to meet their obligations under the Voting Rights Act. The Left, however, certainly would not believe that the Trump Administration was attempting to comply with the Voting Rights Act. Regardless, a number of state attorneys general had requested that information. Without such information, the states they represent will be ill-equipped to defend against the litigation over redistricting that is sure to follow the 2020 Census. Ross had learned that the Commerce Department discovered that its own 2012 estimate of 11 million illegals was wrong. How so? That estimate was based on responses to its American Community Survey (ACS), a more extensive questionnaire which replaced what formerly was the so-called “Long Form.” This form is sent to a small fraction of the population. Using other available federal records which are available, the Census Bureau realizecd that the percentage of respondents falsely claiming to be citizens was significantly higher than the percentage used in 2012 to come up with the estimate of 11 million illegals. The citizenship question is particularly appropriate in light of the large population of illegal aliens in the United States. Political power for each state rests on who is counted in the representative numbers. Gaining or losing numbers relative to other states means gaining or losing political power in the House of Representatives and the Electoral College. For some states like California and Texas, their populations have increased in recent years due to immigration, both legal and illegal. Their political power has increased and that of other states has gone down now because their populations have declined (even if they have increased) relative to the populations of some other states. It was never intended that aliens, i.e. 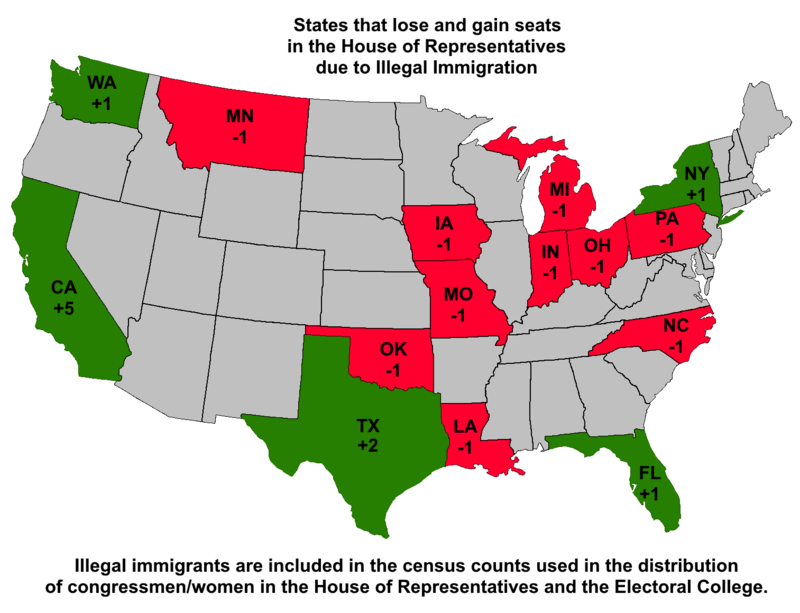 foreign nationals who are citizens or subjects of another country, would be represented in the House of Representatives and the Electoral College. Aliens – whether legal or illegal– are not “Immigrants.” An “immigrant” is a person granted the status of “permanent legal resident” by federal law. They are U.S. nationals and count for purposes of representation. Aliens, including foreign tourists, foreign students, and persons who entered with no legal status or stayed longer than legally allowed, are not to be included in the count for representation. No theory of self-government can justify one country “representing” citizens or subjects of another sovereign. Few American citizens realize that aliens are being represented in Congress and the Electoral college. Once our citizens learn of this, they are generally shocked. Inclusion of aliens among those represented in “We the People of the United States,” ought to offend not only U.S. nationals, but also some aliens and certainly their governments. Far from being unconstitutional, the citizenship question will enable the Trump Administration to put an end to the practice of including aliens in the allocation of House seats and votes in the Electoral College. This will allow for Americans to be fairly represented in their congressional and electoral choices.